Damascus (AFP) – President Bashar al-Assad’s regime held parliamentary polls in areas of Syria under its control on Wednesday, with some voting enthusiastically but others dismissing the elections as a sham. Assad pressed ahead with the vote despite the start Wednesday of another round of UN-brokered peace talks in Geneva aimed at ending the devastating five-year conflict, with a political transition and the Syrian leader’s future key sticking points. Voters could cast ballots at some 7,200 polling stations opened in government-held areas — around a third of the country’s territory where about 60 percent of the population lives. Voting was extended by five hours by the electoral commission until midnight (2100 GMT), state television said, citing a “high turnout”. Assad’s Baath party, which has controlled the country for more than half a century, is expected to extend its dominance of parliament, although several parties are participating in the polls. “I voted because this election will decide the country’s future. 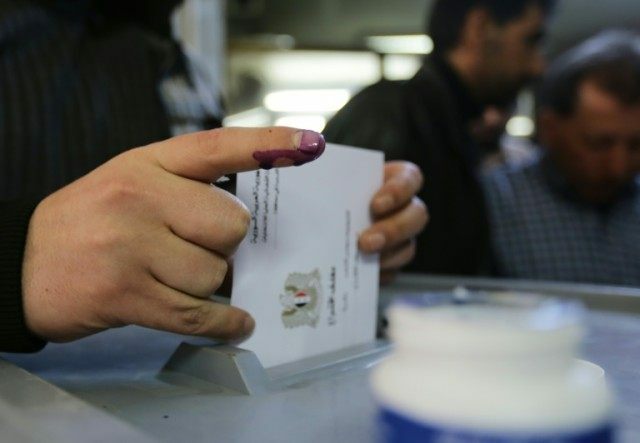 I hope that the winners will be true to the nation even before being true to the voters,” Yamin al-Homsi, a 37-year old who voted in Damascus, told AFP. Samer Issa, a taxi driver, told AFP he had “fulfilled his national duty” by casting his vote. “Now, it’s up to the winners to fulfil their promises,” the 58-year-old added. The presidency published photos of a smiling Assad and his wife Asma casting their ballots in Damascus. “We have been at war for five years but terrorism has failed to reach its main goal, which is to destroy Syria’s social structure and identity as safeguarded in the constitution,” Assad said. In the ancient city of Palmyra, where Russian-backed Syrian forces drove out the Islamic State jihadist group less than three weeks ago, four polling stations opened. “I wasn’t afraid to come vote today,” one newly returned resident said. Last month, the domestic opposition tolerated by the regime called for a widespread boycott, accusing the government of using the vote to gain leverage in the peace talks. The High Negotiations Committee, the main opposition body involved in the negotiations, has branded the election “illegitimate”. In Syria’s divided second city Aleppo, polling stations only opened in western government-held districts. “These elections are a farce and I don’t believe in them,” said Mohammad Zobaidiyyeh, who works as a mechanic in the eastern rebel-controlled neighbourhoods. The vote is the second parliamentary ballot since the beginning of the war in 2011. More than 270,000 people have died since, and millions more have been forced to flee their homes. The country’s economy has all but collapsed and swathes of territory remain out of government control. A record 11,341 candidates initially sought to run for the 250 seats in parliament. About 3,500 candidates remain in the race, after the rest withdrew “saying they had no chance of winning”, Hisham al-Shaar, the head of the Supreme Judicial Elections Committee, told reporters. Walls across Damascus were covered with campaign posters. Outside a polling station at the Damascus governor’s headquarters in the eastern neighbourhood of Yusef al-Azmeh, representatives of various candidates distributed leaflets to potential voters. But Mayssoun, 45, said she will not vote. “Most of these candidates are rich men who live abroad and are just feeding us nonsense,” she said. “I used to have an apartment in Yarmuk that I left because of the clashes, and now I move around from place to place,” the waitress said. The Palestinian refugee camp of Yarmuk in southern Damascus was home to 160,000 people — including Syrians — but has been ravaged by fighting. The controversial polls come amid a surge in violence in recent days threatening a fragile six-week ceasefire. UN Syria envoy Staffan de Mistura will try again to reach a consensus at the talks starting Wednesday in Geneva on ending the war. The negotiations are aimed at agreeing a roadmap to peace, including forming a transitional government followed by general elections supervised by the United Nations in which all Syrians would be eligible to vote.